Over the last 21 years and 12 festivals, 7a*11d, Toronto’s International Festival of Performance Art, has presented performances in the streets, in galleries and storefronts, in repurposed schools and converted industrial spaces. This year the festival was housed for the first time in a theatre: the handsome new Theatre Centre multifunctional building on Queen Street West. However accidental or expedient it may have been on the part of the curatorial collective, this choice deeply informed the audience’s experience of the work: framed by this architectural and institutional context, the festival as a whole insistently raised the vexed question of performance’s complicated relation to theatre and invited a reflection about the impact of framing on live art. Performance art’s obstinate determination to distinguish itself from theatre is evident in the many attempts to formulate a definition of the form precisely in terms of its opposition to theatrical conventions—think, for one, of Marina Abramovič’s dictate: “No rehearsal, no repetition, and no predicted end.” At the same time, the appearance, particularly from the 1980s onwards, of performance styles that deliberately adopt theatrical modes (such as the use of costumes and makeup, a narrative structure, the adoption of character-like personae on the part of artists) complicates the issue and calls for clarification: what exactly are the features of theatre that supposedly make it inherently antithetical to performance art? The setting of this year’s festival, and the specific ways in which it created trouble for a number of the works presented, offer a unique opportunity to reflect upon this question. In ordinary language “theatrical” is often wielded as a term of abuse to describe something (a behaviour, a style, a mode of presentation) perceived as exaggerated or insincere: an excessive display of sympathy from someone known to be cynical and self-interested; someone’s loudly apologetic late arrival to a dinner party; an ostentatiously over-decorated room. Used in these contexts, the expression betrays a deep anti-theatrical prejudice stemming from an equation of theatre with the inauthentic that goes as far back as Plato. In art criticism the term has a somewhat more specific meaning and a history that can be traced back (as Michael Fried has shown) to the second half of the Eighteenth Century, when Diderot used it to characterize unfavourably paintings whose composition suggests a heightened awareness of the beholder—paintings whose subjects appear to be performing for the viewer, whether the performance is one of enticement, self-display, or coy withdrawal. In contrast to this “theatrical” style, Diderot championed paintings whose subjects—whether asleep, engrossed in a game of cards, or in the throes of a crisis—appear oblivious of being beheld. Interestingly, a prime example of this “absorptive” style was provided, according to Diderot, by the work of Jean-Baptiste Greuze, whose busy compositions of characters in heightened emotional states would be characterized, by contemporary standards and in the ordinary sense of the word, as eminently theatrical. According to Diderot’s reading, however, the expressive excess of the characters in Greuze’s paintings indicated their absorption in the dramatic event depicted and functioned to seal off the fictional world of the painting from that of the beholder. In Diderot’s sense, in other words, theatricality does not characterize an expressive quality, but rather a structural feature: the mode of address of the composition itself. If it’s not already clear, the fact that this use of “theatrical” doesn’t imply an overall contempt for the medium as a whole becomes obvious when one considers Diderot’s long-standing involvement in theatre as a theorist, critic, and playwright. As a matter of fact, one of Diderot’s crucial contributions to the field, the idea of the “fourth wall,” is nothing but an absorptive device meant to correct the inherent structural flaw brought about by the proscenium stage: frontal address. It is, in other words, a way of evacuating “theatricality” from theatre itself in a structural— rather than stylistic—way. Interestingly, in performance art, frontal address—even in the most extreme form of a direct engagement with the audience—has never been perceived as inherently “theatrical” in a problematic sense. In fact, it wouldn’t be far-fetched to take this kind of address as one of the defining characters of a certain style of performance art, where it signifies the very opposite of “theatrical”, suggesting instead a kind of unmediated authenticity. As it happens, long before the emergence of performance as an art form, this inversion of values—whereby the fourth wall convention, having exhausted its radical potential, becomes a “theatrical” trope, while a revised kind of frontal address becomes the signifier of (anti-theatrical) “authenticity”—had already taken place in the visual arts themselves. The culminant moment of this inversion occurred in Manet, where, in paintings like the 1862 portrait of Victorine Meurent or Olympia (1863), the very act of head-on posing was revealed, in Michael Fried’s words, as an “absorptive attitude”. There seems to be, however, something about theatre that continues to trouble (and create trouble for) performance. 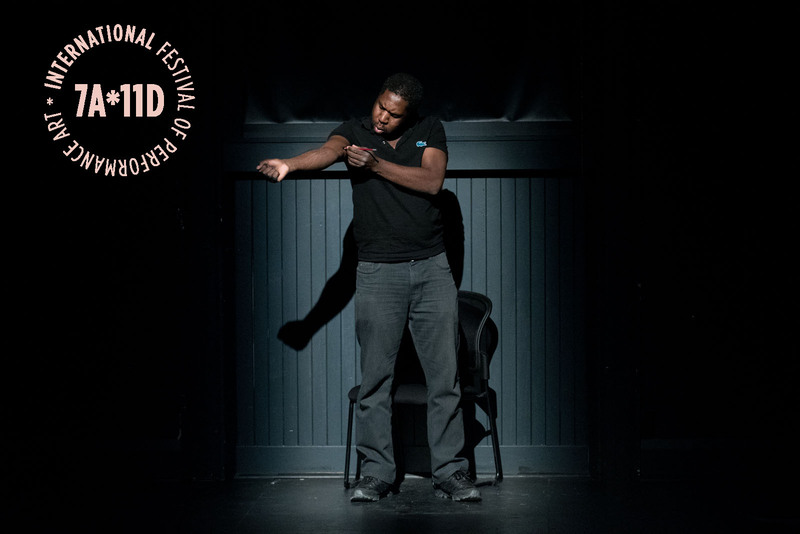 This was evidenced, at this year’s festival, by the number of otherwise compelling works that were undermined, albeit in different ways and to different degrees, simply as a result of being presented in a theatrical context. Although it has nothing to do with frontal address, the troubling feature I’m trying to pinpoint, like the kind of theatricality decried by Diderot, is also structural, rather than stylistic, and it is perhaps best described in terms of a reliance upon framing devices (such as lighting and audience seating) that, though intrinsic to theatre, can have a hampering effect on non-theatrical work to which they are essentially extraneous. I’m thinking in particular of the works (the majority of this year’s offerings) that took place in the main space on the second floor of the Theatre Center. For the festival, the room had been stripped down to its naked walls and turned, quite literally, into a black box. A number of the artists, however, chose to reinstall audience seating. Although this is common practice even when performance is presented in a gallery, in a theatre space this decision often felt unnecessarily constricting and, in conjunction with lighting choices that sharply marked out the performance area separating it from the audience, imposed a kind of forced framing that is usually absent from gallery presentations, where ambient lighting functions to unify the space. The adoption of such extrinsic framing devices greatly affected one’s reception of Erika DeFreitas’s not ever so straight, a performative iteration of the artist’s contribution to Rehearsal for Objects Lie on a Table, a show curated by Emelie Chhangur at the Art Museum of the University of Toronto in the spring of 2016 and based on Gertrude Stein’s 1922 play Objects Lie on a Table. In this iteration of the piece, DeFreitas delivered a text interrogating the oblique evocations of mundane household objects, nuns, and food, packed into Stein’s brief, dense play—as well as its jarringly offhanded references to “Chinamen” and “Negroes”. Parsed into short paragraphs and delivered with thoughtful relentlessness by the artist, the text had some of the opaque, incantatory character of Stein’s original. Displayed on small tables and in vitrines scattered around the space, a great many seemingly incongruous objects and assemblages (apples, ceramic figurines, a tape measure; thread spools surmounted by statues of the Virgin Mary; a candlestick sitting on a bottle) revealed themselves, in the course of the reading, as correlates of the idiosyncratic inventory of objects in Stein’s play. Individually and sharply spotlit in a way that sealed them off from one another, from the audience, and from the artist sitting at a table, DeFreitas’s queer domestic altars reminded one of a gallery display. This lighting choice, combined with a frontal seating arrangement, imposed a rhythm of viewing that (skipping from one spotlit area to another) didn’t serve the performance well and created for the audience the uncomfortable experience of watching a film made entirely of jump cuts. A moving reflection on the loss of cultural memory, Sandra Vida’s Vigil: Field of Crones was created with the collaboration of a group of artists and cultural workers (Lillian Allen, Anne-Marie Bénéteau and Cat Cayuga) who, like Vida herself, have left a significant, if all too often unacknowledged mark on Canadian artist-run culture. Like in DeFreitas’s case, a stark lighting focus on the performance area and a seating arrangement that placed the audience in close proximity to the circle of light that sealed off the action functioned simultaneously as framing and barrier. The sharp separation of action and audience had the unfortunate effect of lending an artful quality to the slow-paced ritual enacted by the four performers, and it turned objects (stones, candles, a smoking cauldron) into mere props. The impression that the piece would have gained in power in a less tightly controlled space—a space in which the invitation to imaginatively participate in a collective ritual was not belied by such harsh framing—was hard to ignore. Mathieu Lacroix’s Ci-après appelé “l’artiste”: interrogated the negotiations of identity as an artist in a heavily bureaucratized art system through a simple, precise, sequence of actions involving the signing of official-looking forms and the marking of the artist’s own body. A charismatic performer, Lacroix carried out the action with a seemingly effortless combination of power and grace. Perhaps in an attempt to comment upon the troubling effect of theatrical framing, Lacroix chose to push this effect to its most constricting extreme, confining the performance to a narrow corridor closely delimited on three sides by the seated audience and bookended by two sharp rectangles of light. Rather than functioning as a means to critically probe the problem, however, this choice had the effect of weighing down to the point of suffocation what could otherwise have been a fully successful work. In all three cases, what seems to have gone wrong is the imposition of aspects of conventional theatrical framing upon work that has not been developed for the theatre. The effect of sharply focussed lighting, in particular, was that of watching the performances through a mediating device external to the work itself—an experience similarly frustrating to that of looking at performance documentation, where the work has already been framed and edited by someone else’s eye. By this I do not meant to invoke, on behalf of live performance, an ideal of immediacy and direct access, to which the medium can perhaps never truly live up. As Amelia Jones and others have persuasively argued, live bodies are, in a sense, always already mediated—always offering themselves, even in the most seemingly “immediate” and “direct” exchanges, as bearers of meanings that are in fact heavily inflected by representational codes. All live performance is always already framed through its own structure. There is a difference, however, between framing that is intrinsic to the work, and one that is imposed through an external apparatus of representation, such as documentary photography and video, or through an external context of presentation, such as, in this case, a theatre. Paradoxically, the two works that most overtly deployed recognizable theatrical forms also suffered, albeit in different ways, from their placement in an actual theatre. A queer exploration of identity construction through the multiplication of selves and alter-egos, James Knott’s James Knott presents… “The Apocalypse in Your Bedroom” Tour was an exhilarating mash-up of live and recorded sounds and images, with a shadow show to boot. Cleverly eschewing the hollow narcissism that characterizes many works by artists of Knott’s generation tackling similar themes, the piece captured the viewers with its expansive generosity, often leaving them confounded as to the nature of what they were looking at and listening to—live-fed or pre-recorded, “real” or simulated. 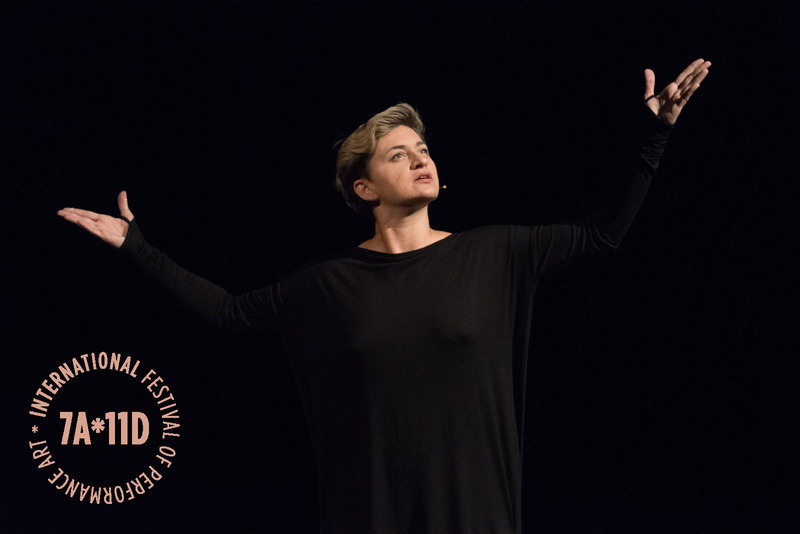 Lala Raščić’s Europa Enterprise, EE-0, a poetic monologue using the myth of Arachne as a springboard for a feminist meditation on personal, political, and ecological transformation, showcased the artist’s acting flair with elegance and formal restraint. Placed inside the Theatre Centre black box, however, Knott’s self-consciously DIY maximalist tour de force ran the risk of being misread as unpolished multimedia theatre, while Raščić’s monologue fit almost too comfortably into its container, leaving the viewer with the perplexing feeling of having opened the wrong door and walked into an actual theatre festival. 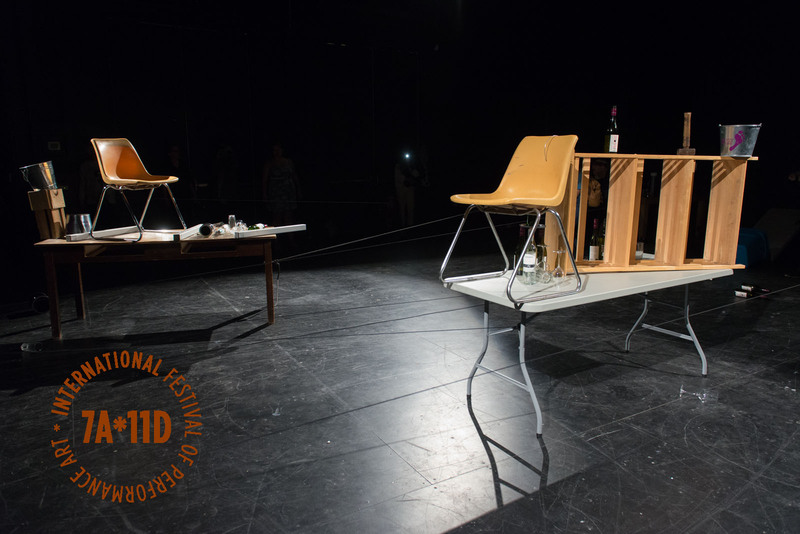 In both cases, one was left wondering how differently the piece might have played had it been allowed to carry out its take on theatrical conventions in dialectical tension with a non-theatrical space. A number of artists were able to use the framing devices afforded by the theatre to their own advantage, successfully incorporating them into the structure of their work. In Love Is The Only Socially Acceptable Psychosis Thirza Jean Cuthand repeatedly poured hot wax on her legs and arms and proceeded to remove it with the blade of a hunting knife. The silent, intensely focused action was accompanied by a large video projection of suburban and rural landscapes and by a recording of excerpts of the artist’s diary reflecting upon an episode of love and mania. The text was simultaneously intensely personal and easy to relate to, replete with brilliant turns of phrase—occasionally droll, always poignant—such as the wonderful: “I wanted to know how she felt, so I told her my feelings”. In this case, the chasm separating the performance area from the audience, and a more diffuse ambient lighting, functioned well to expose the artist’s vulnerability, framing the action as a publicly-enacted private ritual. Multiple projections, dramatic lighting, and the room’s vast blackness also served well to frame the maximalist existentialism of Gustaf Brom’s the unknown story of a forgetful amnesiac in its impassioned play with archetypes of masculinity and femininity and its exuberant manipulations of primary elements—fire, earth, water, air. In Hank Bull’s The Red Jewell a donkey with a philosophical temperament and extremely poor judgement nearly starves himself to death, falls under the power of a captain of industry in a top hat, escapes with the aid of a wise dog and, after an underwater journey as wild as an acid trip, discovers his vocation as an experimental filmmaker. A shadow puppetry show with live narration and musical accompaniment, the piece had its own framing device in the form of the screen on which the action unfolded. It ended, en abyme, with the image of the donkey and the dog looking at a shadow screen—a frame within a frame within a frame. 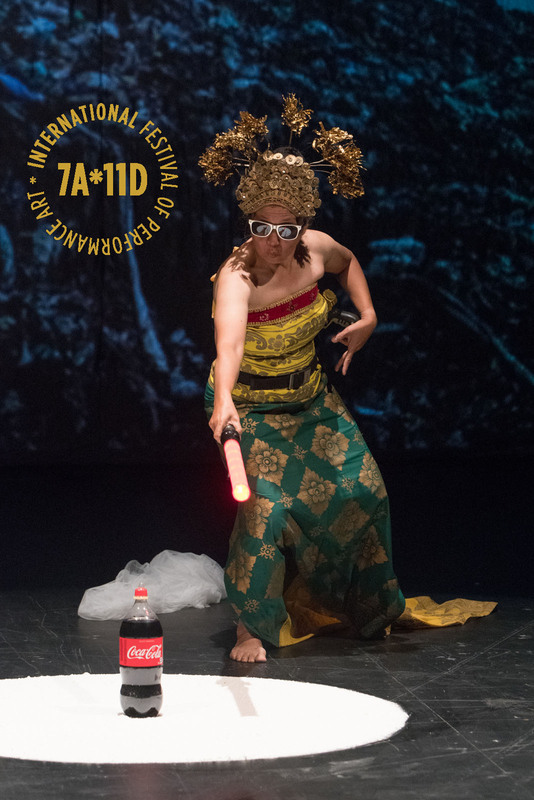 On the last night of the festival, Arahmaiani presented Handle Without Care, in which she addressed issues of globalization, consumerism, and the commodification of indigenous cultures though an acerbic ceremony orbiting around a totemic Coca-Cola bottle and involving a machete, flashing space guns, remote-control toy tanks, and an elaborate ceremonial costume. The effect of heightened theatrics that the dramatic lighting lent to the action helped to highlight the ersatz character of the ritual enacted by the artist, reinforcing one of the focal points of the work. While these pieces managed to deploy certain aspects of the theatrical framing to their own advantage, it is no coincidence that two of the festival’s most successful pieces succeeded, at least in part, precisely because they put this framing at the very centre of the work’s content. 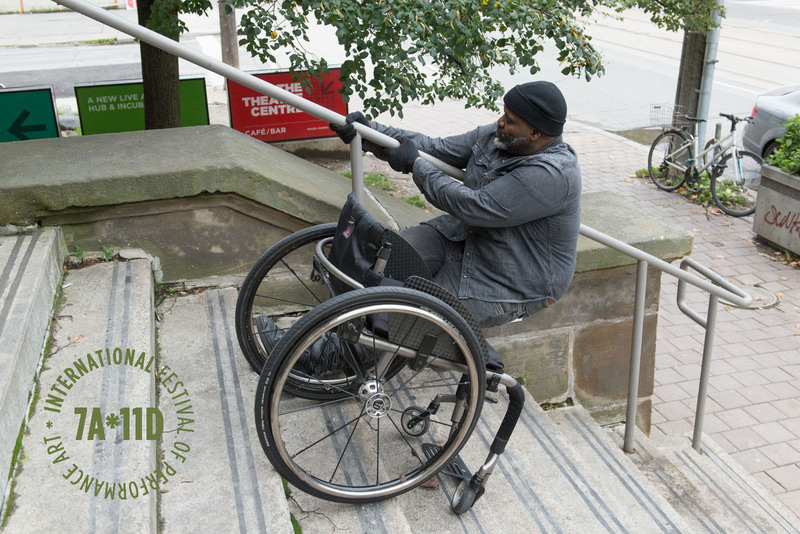 In a series of movements [Toronto] Barak adé Soleil engaged with the architecture of the theatre by navigating the hollowed out main space on the second floor using a variety of mobility aids: crutches, a scooter, a manual wheelchair. In the central section of the piece, the artist lent his body to the recorded voice of Daniel Hamm, one of six African American teenagers arrested in Harlem and convicted of murder in 1965. Hamm, who was exculpated three years later, recounted how, in order to convince the police that he had been beaten up whilst in custody, he had to “open the bruise up, and let some of the blood come out to show them”. A section of Hamm’s recorded testimony was used by American composer Steve Reich in Come out, composed in 1966 for a benefit in support of the Harlem Six. Standing on crutches in the middle of the room, the artist fiercely wrestled with Reich’s composition, dubbing along with the looped segment “come out to show them” until the phrase’s pent-up pain and anger hatched its cathartic double: “come out to shoot them”. The piece, which had started in the ground floor lobby with the reading of a “c/krip” acknowledgment inviting the audience to explore the space with an awareness of the “diversity of bodies” in its midst, came to a breathtaking, drawn-out finale when the artist left the room and proceeded laboriously to climb down the emergency exit stairs on his wheelchair, before disappearing into the street crowd. Dariusz Fodczuk’s publicly yet privately was a darkly humorous take on dramatic conventions, divided into three acts subversively engaging with three of theatre’s essential components: spectacle, character, and audience. Before each of the three short sections, the audience was asked to leave the space and gather in the lobby, where a series of oblique instructions, sent by the artist via text messages, were read out with humorous scepticism by one of the festival’s organizers. In the first act, tables laden with an array of objects (pots and pans, empty bottles and glasses, metal trays and kettles) were pulled across the space, as objects fell tumbling and crashing to the floor, producing an alarming cacophony of noises. In the second act, the artist, in camouflage fatigues, used a paintball gun to shoot the word “love” onto one of the room’s walls. In the third act, the audience huddled on the floor as Fodczuk, wielding a camera-phone, walked around collecting a live video feed that was projected on the back wall. Both adé Soleil and Fodczuk avoided fixed seating arrangements and focussed lighting, encouraging instead a free flow of audience movement and opting for a diffuse ambient lighting that opened up the whole space to the interaction between the audience and the work. At the same time, both placed framing and context dead centre, insisting that we think about theatre as a set of conventions and as an architecture with social and political implications. The first floor studio, with its sunken performance area and more modest size, didn’t present the same pitfalls as the main space: its unconventional architectural features, as well as the fact that it was used during the day to host the festival’s series of artist talks, evacuated from it, at least for this viewer, the overtly theatrical character that haunted the main space. Louise Lilifeldt used its low ceiling to create a striking image involving a fully-grown catalpa tree. Having methodically nipped off the tree’s dead leaves, the artist, climbing up and down a ladder, proceeded to clip with increasingly exacting zeal any leaf showing the slightest blemish. A slow-burning meditation on labour, the piece gained a troubling depth of associations through the identification between labourer and the object of her toil—both the tree’s pot and the artist’s own black t-shirt having been inscribed in white paint with the word “species” halfway through the action. Ayumi Goto and Peter Morin’s Roaming used the intimate, informal setting of the studio for an affable conversation about ancestral lands and histories. 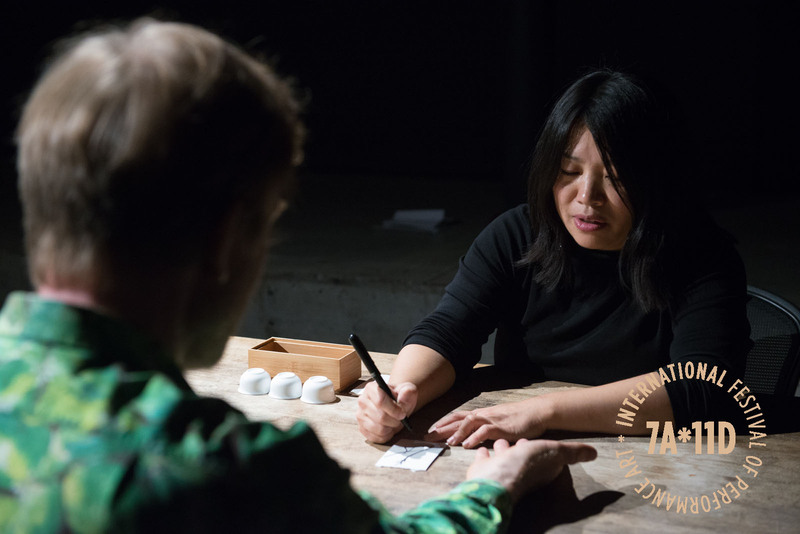 In the same space, Cindy Mocizuchi presented Tenohira, an immersive one-on-one performance in which the spectator was guided through a series of enigmatic actions involving palm reading, puppetry, and the tasting of sweet food. The experience was redolent of the quiet revelations one might receive in a dream: ephemeral, elusive, yet deeply affecting. For the three offsite works in the festival, the question of theatrical framing naturally did not arise. 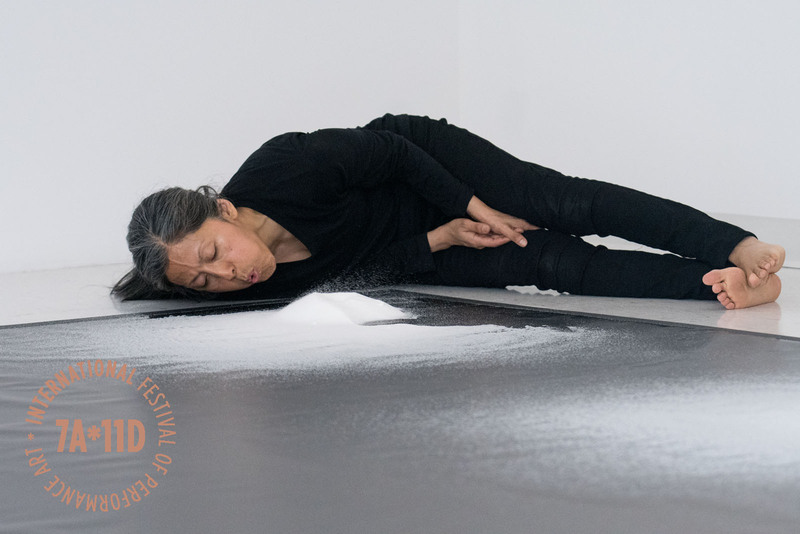 At Sur gallery, over the course of three afternoons, Elvira Santamaría performed Salt Cartographies, a gorgeous durational piece about trade and borders and the shift between symbolic exchange and commerce, in which a large mound of salt, like a magical shape-shifting island, was slowly and continuously reconstituted by the artist’s breath. For Mari usque ad Mare/D’un trou d’eau à l’autre/Piss and Vinegar François Morelli spent a day, from sunrise to sunset, visiting seven of the city’s fountains and carrying out a series of actions in response to each. A slow meditation on water as border and connecting medium, source of sustenance and site of waste, the piece also involved multiple layers of ephemeral “drawing”—whether onto an imaginary map of the city, by walking through it, or onto the actual ground, using water from the fountain of Nathan Phillips Square and a bagful of mismatched sandals washed up by the sea and collected by the artist. In front of the theatre, (F)NOR (Donna Akrey, Andrea Carvalho, Margaret Flood, and Svava Thordis Juliusson) presented Exhausted, a tableau vivant of Picasso’s 1907 Les Demoiselles d’Avignon, in which the collective, wearing awkwardly padded costumes to match the angular, disjointed body shapes in Picasso’s proto-Cubist painting, humorously exposed the labour involved in posing for the male gaze. While interrogating throughout the week the choice to host this year’s festival in a theatre, one remained painfully aware that, in a city whose rampant gentrification has been causing a rapid disappearance of affordable spaces, these choices are never really choices. The kind of spaces out of which performance emerged as a genre in the late 1960s and ‘70s—abandoned industrial sites and public buildings, small galleries and underground theatres—simply don’t exist in the city anymore. The Toronto Free Gallery, for one, which co-hosted four 7a*11d festivals between 2006 and 2012, had to close its doors shortly after the last festival as a result of the usual combination of funding cuts and rent increases. Meanwhile, larger artist-run spaces such as Mercer Union (which also housed a number of the festival’s earlier iterations) have refashioned themselves on the model of more established art institutions. With programs decided years in advance and pristine spaces unable to handle the messiness of performance, this is a model that, while ensuring, at least in the short term, an organization’s survival in the ecosystem of contemporary visual arts, is also ill-suited to a lot of the work that a festival like 7a*11d has to offer. Although performance doesn’t always have to be site-specific, it remains the case that, as performances are forced out of the kinds of spaces in and for which they have traditionally been developed, questions of framing and context become, for artists and programmers alike, more pressing than ever.